Below please find the most Frequently Asked Questions about our E3Live Affiliate Program. Please click the link to read the questions provided. What is the E3Live Affiliate Program? Our E3Live Web Affiliate program was created so you may earn commissions on the U.S. & Canadian sales (select products only for Canada, when available) you refer from your website, blog, e-newsletter, social media or other online page. We offer this program in lieu of link exchanges so you will receive commissions for the traffic you send to us. There is no cost to join and no obligation. Will my audience get a discount when ordering via my affiliate links? The E3Live Affiliate program is not be a discount program for your audience, but we have specials running all the time (see the Specials page for current ones: www.e3live.com/specials) and you may promote any of our in-house specials paired with your affiliate link to earn greater commissions. Do I have to have a website to join the affiliate program? No — you can place the links on your other web pages that allow you to use html or plain links; like blogs, social media sites (i.e. Facebook and Twitter), and more. You can also place the links in an e-newsletter to your list (where recipients have opted-in) or similar. Does it matter where I am located, do you accept only participants from certain locations? We are only accepting participants from the USA and Canada at this time. Please Note: We are able to pay commissions on U.S. web sales only. All valid U.S. online sales are eligible for commissions. Are there any fees to join or participate in the affiliate program, am I signing a contract or obligated in any way? No fees or obligation. There is no signed contract, however submitting an application to us indicates you have read and agree to the E3Live Affiliate Program Agreement Terms. I am already an E3Live Distributor — can I join the E3Live Affiliate Program also? Many of our distributors are also affiliates, the two programs are separate, so being in one does not automatically mean you are enrolled in the other, you would need to sign up to become an affiliate also. The distributor program is much more hands-on, requires a higher level of commitment, a signed contract, and has specific requirements like minimum orders per month, and more, but also allows for higher commissions since the level of commitment is higher. The affiliate program is no obligation at all — you may do as much or as little as you like, no specific amount of sales are required. The affiliate program is for someone who has online pages where they can place affiliate links (like html photo banners) and wants to earn commissions on sales they refer to E3Live without handling actual product, shipping, customer service and the like. Many distributors are also affiliates - to cover more ground. (Anyone interested in learning more about becoming an E3Live Distributor can call toll-free 888-800-7070 and ask for more details on the Distributor Program). How do I sign up to be an affiliate & when do I know that I was approved? You may sign up on the Sign-Up Page, it takes you to a secure page that asks for your contact information and only takes a minute or two to complete.This contact information is how we know where to send your checks so please fill out each part accurately (you can also edit this information in your account after you are approved under the Personal Profile tab).You will get an email from us right away saying we received your application, but it is pending approval.Please do not sign up more than once, it will delay the processing of your account. Applications are typically approved the same business day, but may take 1-2 business days. You will receive another email once you are approved. The sign up page asks for my Tax ID — what is this? Do I have to enter this? U.S. Businesses have a Tax ID number that they should enter in this field. U.S. Individuals that do not have a Tax ID would use their Social Security number. It is a secure page, but if you prefer not to enter your SS# during signup, just enter placeholder numbers (like 111-11-1111) and once you are approved, login to your account, go to the tab marked Personal Profile and edit the Tax ID field. Do not forget to go back and add this to your account information — we need this Tax ID number in order to pay you the commissions you earn. Canadian affiliates can just enter placeholder numbers such as 111-11-1111, and will not need to edit it later. You will earn 20% on the valid sales that come from your links (a.k.a. First Tier sales) and you will also earn 10% from valid Second Tier sales (sales that people signed up under you in your Second Tier have made). What are Second Tier sales? Is this a Multi-Level Marketing program? No it is not multi-level marketing — it is two tiers, no further, no fees, no obligations, no product purchase requirements on your part at all. How often will I get paid and what form is the payment in? We pay commissions out each month — usually around the middle of the month, give or take a few days or depending on holidays, etc. It would arrive as a paper check from our company (Klamath Algae Products, Inc. dba E3Live). This is sent using the contact information in your account — so please keep it up to date so we can send your checks to you. You may update your contact info under the Personal Profile tab anytime when you login to your account. Can I earn commission on E3Live orders I place for myself? No — as stated in the sign up Terms, no commissions can be paid on "self orders", this is not a discount program rather it is a sales-based program. However, our affiliates earn great commissions and we know that a majority of them turn around and use part of their commission money to purchase their own supply of E3Live products, especially when we have great Special Offers happening. What is a 90-Day cookie? This is the length of time you will be able to earn commissions on the clients you refer to us. For example if a client enters our website via your affiliate link and orders from us, you would receive the 20% commission on that approved sale. If that same client orders from us anytime in the next 90 days — even if they skip your website and come to our website directly, you still earn commissions on that person for each online order they place in that 90 days. As long as their first visit was via your link (even if they did not order that first visit), then they are yours for 90 days. Once the 90 days is up, the person becomes a house account. We offer the 90-Day cookie even though the industry average is closer to 20-30 days since we want you to have a greater chance of earning several commissions on the same person — i.e. there is a better chance they would place several orders within the 90 days, as our clients often do. Where do I find the code for Basic Text Links and Banner Links? Once you are approved, you would login to your account and go to the Get Links Tab, there you will find Basic Text Links, Banner Links (be sure to look in the fancy photo banners too). Do you have other Photo Banners than what I see in my admin area? Those are what we have at this time, however many affiliates that know how to use html choose to create their own banner. They do this by using their Basic Text Link paired with the photo of their choice (like a photo from our website that you like). This way — you may change the photo out periodically but still have the affiliate link there. Can I use content, photos, and other information from the www.e3live.com website to promote the E3Live Affiliate Program? Yes — as long as it is for purposes of the affiliate program. We have many recipes, testimonials, photos, and other content that you can use on your website, blog, social media page each week — just be sure pair the info with your affiliate link so you earn commissions on the sales that result. Please make sure your site is not designed exactly like ours, i.e. using the same colors, fonts, graphics and layout to look exactly like www.E3live.com - we want you to use your own design, with your own flair while being able to use various text and images from our site integrated into your design, but it should be clear to visitors that E3Live does not own or operate your site (besides - our website layout and design is copyright protected). Do you make websites for affiliates to use? No — we do not provide websites, templates, or web design services — this would be up to you. We actually would not want to provide a standard template because it would prevent affiliates from bringing their own personalities to the mix. Our kind of product is very much a "word-of-mouth" type product, so the more you can relay your positive personal experiences with E3 products in your own style, the more people will want to try it. 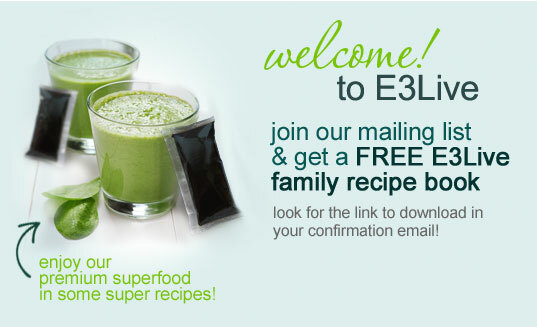 If you do not have personal experiences to share yet, consider using one or more of our many Testimonials we have on our www.e3live.com site. My email address, name, phone number or mailing address has changed or I want to change my password — how do I change this in my affiliate account? You can login to your account and go to the Personal Profile tab — here you may change your personal information. It is important for you to keep this up to date, so we can send the commissions to the right place. Also keeping your email current will allow us to reach you more easily if we have success tips to share. Note: If you are also an E3Live Distributor, an E3Live client or otherwise connected to E3Live — you will need to also change your contact info with our main office by emailing sales@e3live.com or calling 541-273-2212 or toll-free 888-800-7070 PST. Changing the info in your affiliate admin does not change it in our main database, since the two are separate. I have been approved as an affiliate, how do I log in to my affiliate account to get started? Once you are approved, you will need your 4-digit affiliate number and the password you created in order to log in each time. Please make a note of these and keep them in a safe place. You may log in on the Affiliate Login Page. You can bookmark this page or add to your Favorites for easier access next time you want to login. I have questions that were not answered here — who can I ask? You may contact Cindy at: cindy@e3live.com and she will be able to help you (no solicitations please).